The logo of our program has two ginkgo leaves, just like that of the University of Tokyo. The edge of each ginkgo leaf represents the alphabet “S” – symbolizing “Science” and “Society” – and the design shows our aspiration to have them close, partly overlapping and sitting together harmoniously. In modern society, science and technology can be found in every aspect of our everyday life. However, the psychological distance between ‘science and technology,’ which exhibits a high degree of complexity and sophistication, and ‘us’ continues to grow. And there has been widespread concern about the lack of interest among the public in advances in science and technology. If the situation continues, the relationship between science, technology and society will soon deteriorate, potentially causing undesirable consequences. 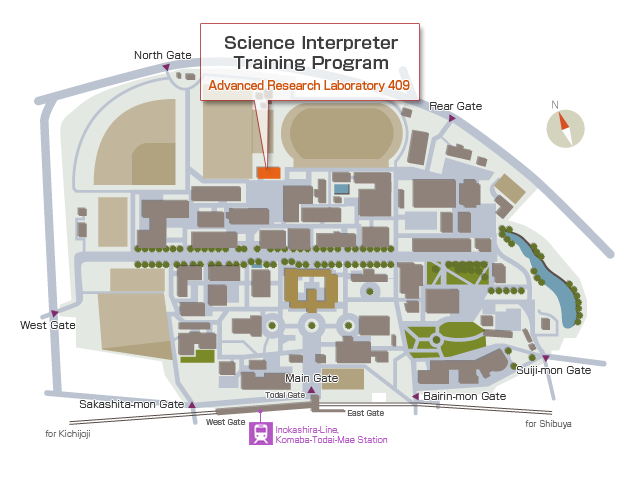 The Science Interpreter Training Program at the University of Tokyo was established in 2005 to respond to this situation, along with similar-minded programs at Hokkaido University and Waseda University, with the support of Japan Science and Technology Agency (JST). 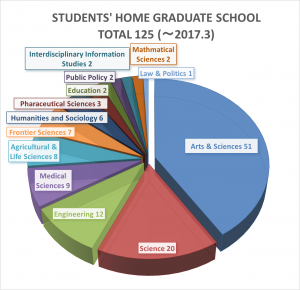 The Program is open to graduate students with any disciplinary background across the university, and our students are encouraged to develop expertise in their own discipline, but rather than being confined to it, with the sensitivity to issues and challenges of science, technology and society and the ability to address them adequately. Our curriculum offers them an invaluable opportunity to learn different ways of thinking about their own expertise and gain a broader perspective on it than their discipline alone could provide. To do so, we collaborate with a range of highly experienced instructors, both in and outside the university, and give students time for informed discussion with their fellow students, who may have different views and ideas. Our goal is to nurture scientists and engineers who are equipped with social and political literacy and treasure the presence of multiple perspectives, as well as scholars in humanities and social sciences who can identify common grounds between their disciplinary standpoint and visions and values in science and technology. We believe that an important mission of our university is to train individuals who can facilitate two-way communication between science and technology on the one hand and society on the other, and our program – recognizing this socially desirable function of experts as ‘science interpretation’ – plays an important role in accomplishing this mission. Since our program is classified as a ‘minor’ curriculum within the university’s graduate education, students (and instructors too) have to make extra effort to take full advantage of it. Yet, what they learn from and experience through the program would allow them to take leadership in producing better relationship between science, technology and society for years to come. Our program focuses on not only ‘how to communicate’ but also ‘what ought to be communicated’ in the process of science interpretation. To consider ‘what to communicate’, one needs to understand and be able to explain practices of science and technology – for example, how data are produced and how they are used. The program therefore allows its students to familiarize themselves with the scientific mode of thinking as well as to attend ethical, legal, cultural and socio-economic aspects of science and technology. Our program accepts approximately 10 students every year. The small size of each class allows students to benefit from both close relationship with their instructors who are also leading researchers and/or practitioners in their own field and lively discussions with their fellow students with different disciplinary backgrounds. At the university, our program is officially recognized as a minor curriculum in its graduate education, which aims to provide extra training to students who develop expertise in their major study. Our curriculum begins in the Autumn/Winter semester and can be completed in minimum of a year and a half, which most of our students actually do. Students who fulfill all the requirements and complete the program will receive a certificate of program completion from the Dean of the Graduate School of Arts and Sciences. Our program consists of courses focusing on theories and concepts as well as those offering practical skills and experiences, and they are delivered by highly experienced professionals in and outside the university. There is also an opportunity to go a field trip with your fellow students – every year, students themselves decide the theme of the field trip and where they go. 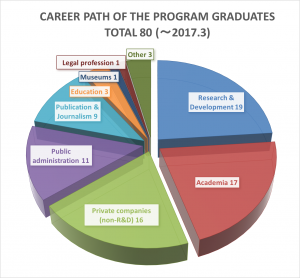 Our program accepts students enrolled in a broad range of major studies, and the graduates of our program have chosen to pursue diverging career paths in the past years, including research and development (R&D) in private sector, science and technology policy, education and journalism, as well as staying in academia for further research. Our program was established as a university-wide minor program for highly-motivated graduate students, regardless of whether they major in science and engineering or in humanities and social sciences, and its curriculum is designed to train individuals who wish to understand issues that arise at the interface of science/technology and society and take leadership in addressing such issues. 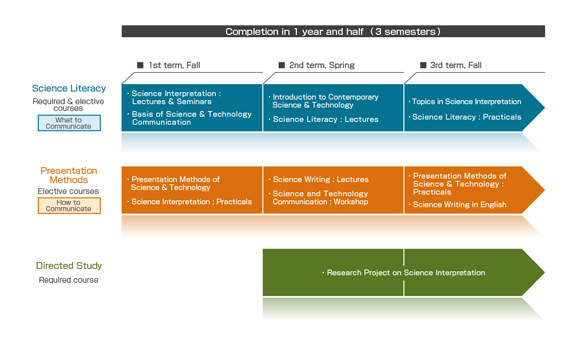 The curriculum begins in Autumn/Winter semester and can be completed within a year and a half. On completion of the program, a certificate is presented by the Dean of the Graduate School of Arts and Sciences.